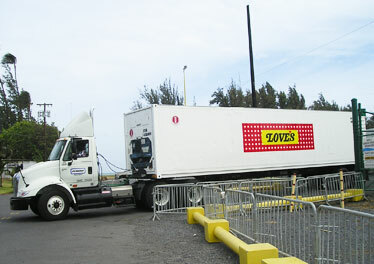 A Love's Bakery truck from Oahu rolled out of Kahului Harbor on Maui yesterday after arriving on the Hawaii Superferry. WAILUKU » Freight-forwarding businesses and the Hawaii Superferry are bridging the gap left by the closing of Aloha Airlines' cargo services, and Pacific Air Cargo will soon be shuttling large amounts of refrigerated perishables. Pacific Air Cargo's new Boeing 727 was scheduled to arrive last night from the mainland. Kathy Lyons, secretary of the Air Cargo Association of Hawaii, said that once Pacific Air Cargo completes its move to expand interisland freight service, the demand for air cargo deliveries should lessen significantly. Lyons said the Boeing 727 would provide services needed for perishables, including refrigeration, and could handle pallet deliveries. Lyons, whose association represents some air carriers, freight forwarders, truckers and major shippers, said the Pacific Air Cargo service might not satisfy all the needs immediately, but would move air freight service in the right direction statewide. Freight forwarders in many cases consolidate different shipments to go in containers on Young Bros. barges, but some are opting for the Superferry. A least a couple of major businesses, such as Love's Bakery, are taking advantage of the Superferry on the Oahu-Maui route. Love's Bakery President Mike Walters said his business has cut the cost of delivery (by Aloha Air cargo) in half by having a driver deliver products in a refrigerated truck to Maui. "It's an excellent partnership," Walters said. Maui resident Teena Rasmussen, co-owner of Paradise Flower Farms, said the Aloha shutdown forced her to look elsewhere, and she found a freight-forwarding business with refrigeration that could carry her carnations on the Hawaii Superferry for a lower price. Rasmussen said she is paying the introductory price of 15 cents a pound, instead of 50 cents a pound by air. "I'm really excited about it," she said. Rasmussen said she still has to use Hawaiian Airlines for air shipments to the Big Island and Kauai, and she will have to find a shipping alternative if the Superferry is unable to make a crossing in the winter. Some businesses say they are still hurting, and volume is down and costs are up, especially for perishable items shipped among the neighbor islands, including the Big Island and Hawaii. "It's very devastating," said Norma Acob, Commodity Forwarders regional manager. "I don't think the state of Hawaii did enough to head off this." Acob said interisland air freight is being moved primarily on a space-available basis, raising major worries among shippers of perishable products. Hawaiian Airlines spokesman Keoni Wagner said his business has been trying to accommodate the increase in passengers and cargo since Aloha Airlines shut down its passenger and freight operations. Wagner said Hawaiian Airlines began flying wide-body Boeing 767s four times a day on the Oahu-Maui route. Wagner said while Hawaiian Airlines has been moving double the volume of cargo since the Aloha shutdown, it continues to focus on passenger service. "We're really focusing on making sure the passenger needs are met," he said. "We're simply not able to fill the void on the cargo side as we have on the passenger side."